Krampus is one of the least-used skins, but gaining popularity after Winter Wonderland’s release. It’s no coincidence that all the Junkrats in your Overwatch matches seem to be wearing a Halloween Terror skin issued in 2016—Dr. Junkenstein. The skin, a take on Mary Shelley’s Dr. Frankenstein, is the top Junkrat skin in Overwatch, according to Overwatch developer Bill Warnecke. The Australian explosives master has nine Legendary skins: Fool, Jester, Hayseed, Scarecrow, Cricket, Dr. Junkenstein, Beachrat, Bilgerat, and the newly added Krampus skin. Five of these skins were tied to Overwatch’s seasonal events, making them extra special in the Overwatch universe. Warnecke didn’t add where Dr. Junkenstein sits on the list of overall top skins in Overwatch. 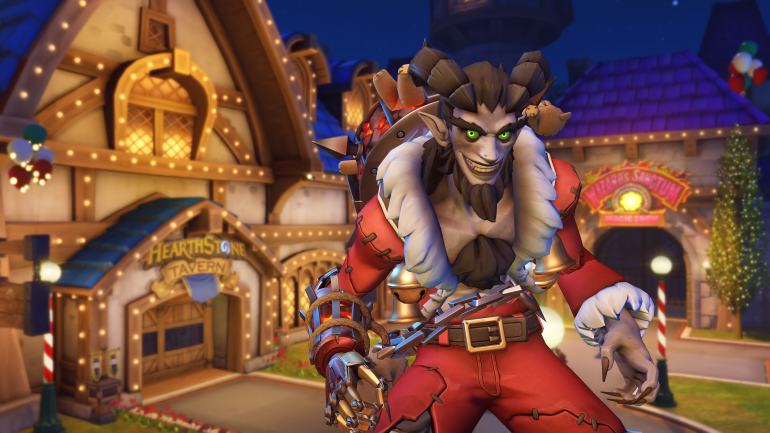 Krampus was added to Overwatch on Dec. 11 with the Winter Wonderland kick-off, so many fans—except for, perhaps, the die-hard junkers—are probably still working toward an unlock. The skin is only available until Jan. 2, when the Winter Wonderland 2018 ends. The skin’s available for 3,000 Overwatch credits, or you could gamble on unlocking it in one of Overwatch’s loot boxes.